Today is the day that all the previous planning fully went out the window. Memphis wasn't really on the schedule, but it didn't seem that much out of the way and we were still going to Nashville so it was fine. Today, we didn't even set foot in Nashville at all, instead we spent most of the day in Memphis, which it turns out has so much to offer, and then drove past Nashville and are spending the night in Georgetown, Kentucky. It's all for a good cause I think, you'll find out tomorrow if we are successful. On to the recap! First up on our second day in Memphis was the Bass Pro Shops Pyramid. This thing is crazy. There's a huge gallery below, but it really doesn't do the place justice. The best way I can describe it is that it's what you would get if you crossed the Luxor with a Wal-mart and the result grew up in a swamp. It's just crazy. The history of the place is also nuts, I'm going to give you the brief version here, but you should look at the Wikipedia article if you're interested. It was originally built as a twenty thousand seat basketball arena and was known as the Pyramid Arena(or to locals as simply, "the Pyramid," of course. 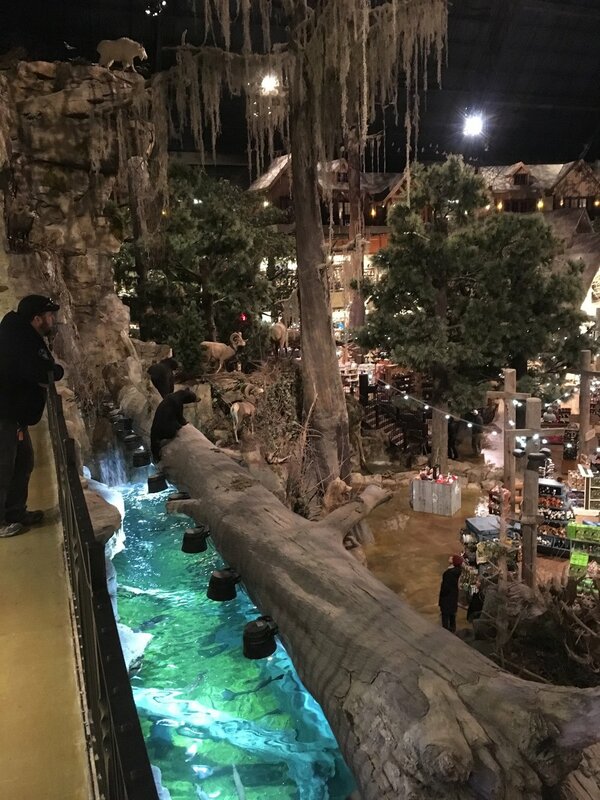 It's been abandoned since 2004 until it reopened in 2015 as a Bass Pro Shop "Megastore." It contains: an indoor archery range, a pistol range, a 100 room hotel(with treehouse rooms), a bowling alley, two restaurants(one at the top of the pyramid), an observation deck, a duck hunting museum, a few giant open pools full of fish, a massive open fish tank with enough room for a scuba diver, the tallest freestanding elevator in America, and oh yeah, wait, I'm forgetting something... oh yeah... the biggest Bass Pro Shop I've ever seen. We had a blast looking at all of the cool stuff and spent way longer there than we had originally planned. Then it was back to Memphis Escape Rooms to test our wits against the Lost Pyramid. Which turned out to be awesome. Extremely good set design, challenging but not impossible puzzles, some really great dramatic moments. It also helps that we crushed the previous record by like 6 minutes. The one thing I wanted to mention about this company that I didn't yesterday is that they have a room that is themed in conjunction with the Memphis Grizzlies and part of the proceeds from the room go to a charity they're associated with. We didn't do that room, but it sounds like a great idea. We got a tip from our game master that Corky's BBQ was a good place to go and so we headed there for lunch. Pulled pork nachos and two racks of "Memphis muddy" ribs later we were stuffed and ready for some drive time. Over the next few hours we kept changing our plans and destinations in the GPS about every 20 minutes. We finally arrived at Georgetown after a small snack at a White Castle and we're turning in for the night. Hopefully I'll have something exciting to share with you tomorrow, but I'm trying to to jinx it.